Our Distance Education project gives all students, regardless of the resources of their local school district and without the burden of travel costs, access to a high quality educational experience through on-line activities and electronic field trips via video conference. We offer a unique inter-curricular learning experience that provides teachers with lesson plans and web-based interactive learning modules, using inquiry-based critical thinking and problem solving skills. 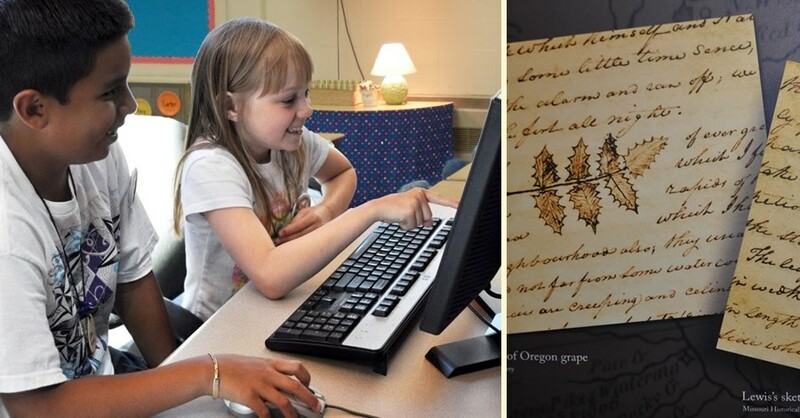 This award-winning project is correlated with Oregon Curriculum Standards, Learning Benchmarks, and STEM (Science, Technology, Engineering, and Math) goals. The interactive learning exposes students to the cumulative nature of scientific inquiry and inspires student-directed independent learning. Students learn about the subjectivity of interpreting history and see how science can be a tool to understand it, thus providing a bridge between humanity and science disciplines. These activities require: Adobe Acrobat Reader and Adobe Flash Player. Explore navigational tools and techniques of Lewis and Clark, and try to determine their latitude using those instruments and techniques. Compare latitude calculations made by the explorers with actual locations known today and analyze the discrepancies. This activity uses Flash technology to actively involve learners. Make mathematical calculations like Lewis and Clark did on their expedition. Explore river current velocity, distance, and direction of travel. Each successful calculation moves you closer to the Pacific Ocean. This activity uses Flash technology to actively involve learners. In this WebQuest, students in grades 9-12 investigate scientific inquiry on the Lewis and Clark expedition, by examining their roles as ethnographers, linguists, and paleontologists. Archaeologist and historian Ken Karsmizki sheds light on the mystery of the Lewis & Clark Rock Fort in The Dalles, Oregon including NASA’s contribution to his research, and the ongoing saga to retrace Lewis & Clark’s expedition. Interviewed by Localite host Jon Compton, July 16, 2010.